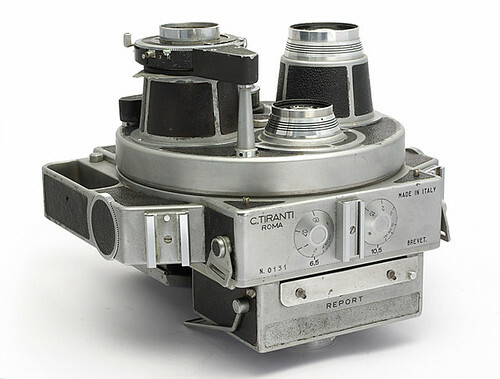 The Summa Report is a rare and unusual press camera, made in about 1954 by Tiranti of Rome. 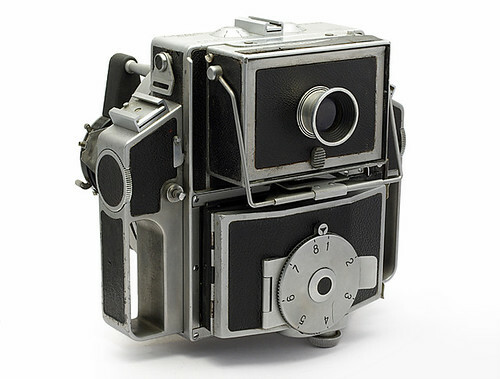 It is one of only three cameras for which Tiranti is known, and Dario Mondonico states that only 100 were made (numbered 101 to 200). It makes 2¼x3¼-inch (6x9 cm) images on 120 film (or plates or film-packs). The camera has a very unusual structure. Essentially, it comprises two connected view cameras, one above the other; the upper camera is used purely for focusing, while the lower one takes the photograph; a twin-lens camera, but not reflex. The camera is equipped with both standard and wide-angle lenses, permanently mounted on a rotating lens-turret on the front, allowing the desired lens to be selected by rotating it into position, as on many cine cameras. Thus (to serve both the 'viewing' and 'taking' cameras) there are two pairs of lenses, standard and wide-angle. The lens-turret is a substantial aluminium casting. The taking lenses, by Schneider, are a 105 mm f/3.5 or f/4.5 Xenar and a 65 mm f/6.8 Angulon. 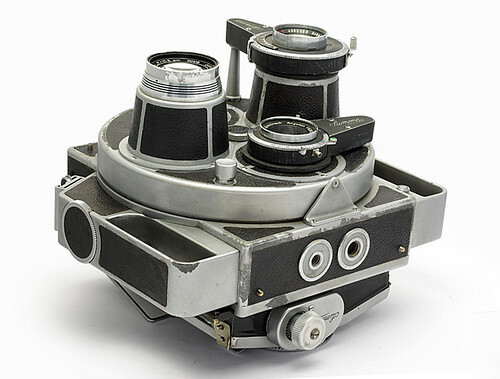 On some examples, the viewing lenses are Reflar lenses of wider aperture (f/4 and f/3.5 respectively), by Officine Galileo; McKeown describes the camera with this specification, and an example with these lenses (pictured here) was offered in an on-line auction. An example was sold at Westlicht, however, with f/4.5 Xenars for both the viewing and taking standard lenses. Another, also sold at Westlicht, has f/6.8 Angulons as both the viewing and taking wide-angle lenses, an f/3.5 Xenar as the standard taking lens, and an f/5.6 Symmar as the standard viewing lens. It seems unlikely that this viewing lens is the original one; it would be odd to fit a viewing lens of smaller maximum aperture than the taking lens, and the lens also appears to have an iris diaphragm, of little value in a viewing lens, in the auction listing photographs. In most of the cameras, each of the taking lenses is mounted in a Synchro-Compur shutter, giving speeds 1 - 1/500 second, plus 'B', and of course flash synchronisation. 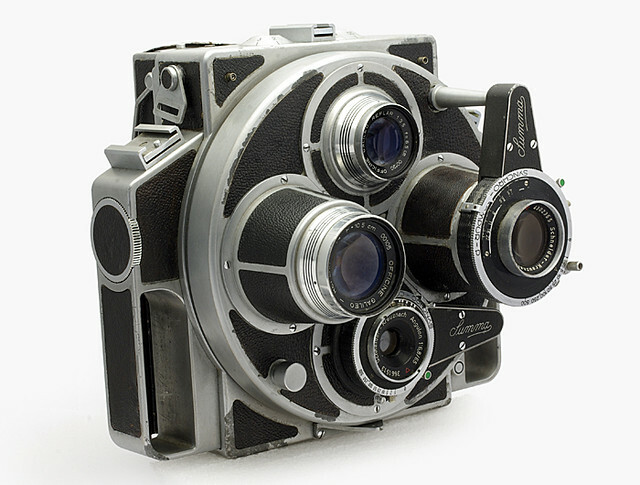 In the last example cited, however, the wide taking lens is mounted in a Compur-Rapid shutter, giving the same speeds but not synchronisation; again, it is possible that the lens and shutter are not original, or that this example, late in the series, was assembled from available parts. The camera has several options for view-finding. The focusing screen may be used; it has a folding hood, which incorporates a loupe for critical focusing. There is a system for automatic correction of parallax error, using moving slats to mask the focusing screen differently as the focus distance is changed. When folded down, the hood incorporates an eyepiece to form a direct eye-level viewfinder. Finally there is a folding frame finder, which erects above the camera body; this places the finder a long way above the taking lens, so it must suffer from severe parallax error at close range. There are handles on each side of the body. Each handle incorporates a thumb-wheel for focusing, and there is a shutter release button on the rear of each handle, also positioned for the thumb. There are dials indicating the focus distance (one dial for the standard and one for the wide-angle lens) on top of the body. The camera has two accessory shoes for mounting flash-bulb holders; each of these can be separately connected by switches on the side-handles. The camera has an interlock preventing the shutter from releasing when the dark-slide is in place. ↑ 1.0 1.1 McKeown, James M. and Joan C. McKeown's Price Guide to Antique and Classic Cameras, 12th Edition, 2005-2006. USA, Centennial Photo Service, 2004. ISBN 0-931838-40-1 (hardcover). ISBN 0-931838-41-X (softcover). p920. ↑ Article on Tiranti cameras including the Summa Report, at Dario Mondonico's Mistermondo site; company history, descriptions of the cameras (in Italian), and one picture Summa Report. ↑ The notes in the listing for Summa Report no. 155 at Christies (linked below) state the serial no. range 100-200. The notes cite (not specifically for this detail) Antonetto, M. & Malavolti, M. (1983), Made in Italy, pub. G. Balderacchi, Milan, p.146, item no. 264. ↑ Summa Report serial no. 0131, offered as Ebay item 190696857389. ↑ Summa Report serial no. 0186 sold at the sixteenth Westlicht Photographica Auction, on 5 December 2009, and the same camera sold again at the 24th Westlicht auction, on 23 November 2013; several excellent photographs of the camera. ↑ Summa Report serial no. 0196 sold at the 22nd Westlich auction, on 24 November 2012. ↑ 7.0 7.1 7.2 7.3 US Patent 2812698, Camera, filed 1954 and granted 1957 to Flaminio Tiranti; at Espacenet, the Patent search facility of the European Patent Office. Summa Report (serial no. not given) in highlights of an auction by Auction Team Breker in Cologne in 2009; several pictures of the camera, which has Galileo viewing lenses. Listing for Summa Report serial no. 155, sold at Christie's in London in February 1999. No picture, but the listing states that the camera has f/3.5 Xenars as both viewing and taking lenses at 105 mm, but a Reflar viewing lens at 65 mm. Listing for Summa Report serial no. 163, sold at Christie's in June 1998. One picture. This camera has f/4.5 Xenars for taking and viewing lenses at 105 mm, and a Reflar as the viewing lens at 65 mm. Listing for Summa Report serial no. 195, sold at Christie's in October 1996. Brief details but no picture. Listing for Summa Report serial no. 198, also sold at Christie's in October 1996. Brief details but no picture. Listing for Summa Report serial no. 200 (i.e. 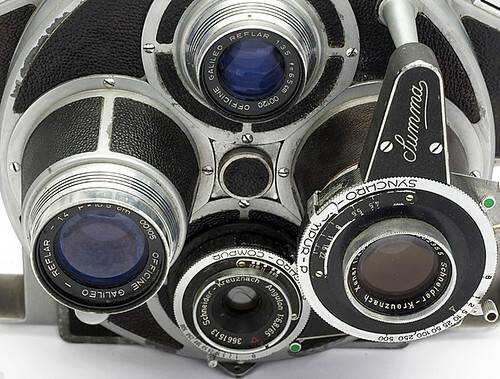 the last camera made, according to Dario Mondonico, cited above), also sold at Christie's in October 1996. Brief details but no picture. This camera has an f/3.5 Xenar, and Reflars as both viewing lenses. It is covered in tan snakeskin. This page was last edited on 23 June 2017, at 07:57.